On the hunt for a volume HUD-enhancing package for iOS 7.1.x? 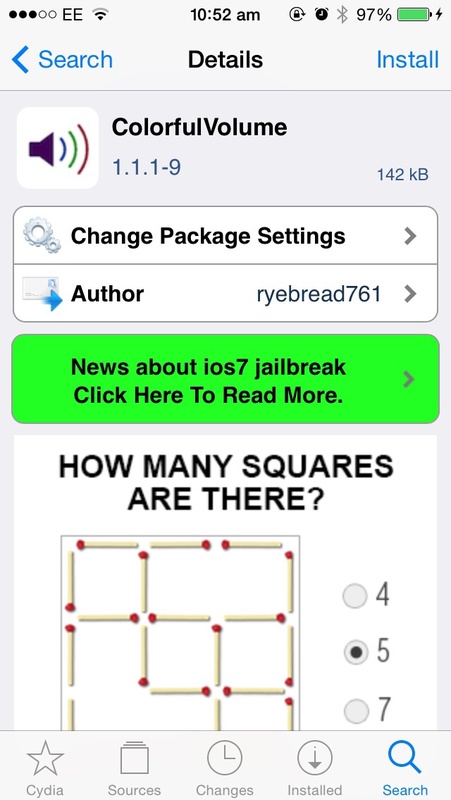 Check out ColorfulVolume, a brand new jailbreak tweak that’s available to download free of charge on the Cydia Store. ColorfulVolume allows jailbreakers to do two things: alter the color of the volume HUD interface, and add custom text to the top of this interface. You can do both from inside the Settings app, where ColorfulVolume adds a dedicated preferences pane. Here, you can enable or disable the jailbreak tweak outright, and RGB sliders allow users to precisely configure the color of their HUD. There’s a randomized color option, too, and a toggle button which allows users to apply the change to the ringer HUD is also available. Finally, users can input a “Custom Title” for the volume HUD to display; this can be anything you like, and text can be inputted on the fly from the same preferences page. You can download ColorfulVolume now on the Cydia Store, and it’s available free of charge. As mentioned, the package is optimized for iOS 7.1.x, meaning jailbreakers who’ve used the Pangu solution to liberate their iOS device will indeed be able to enjoy the new package. See also: BodyWise 2.0 Features New Design, Fitbit And Jawbone UP Syncing Plus More, Foxconn’s Upcoming ‘Foxbots’ Could Build Your Future iPhones, and Wink App Goes 2.0 With Support For More ‘Smart Home’ Products From More Brands.